Garuda, the divine eagle and vehicle of Vishnu, appears to rescue Rama and Lakshman who were bound by the Nagapasha Arrow of Indrajit in the Ramayana. The episode is mentioned in the Yuddha Kanda of the Ramayana. Indrajit who could not withstand the assault of Rama uses magic (Maya) to fight. 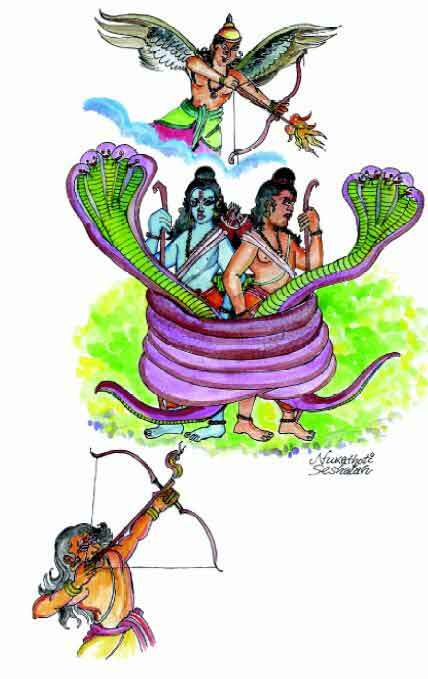 He disappears into the sky and shoots arrows on Rama and Lakshman. Both Rama and Lakshman are injured as they cannot see Indrajit and his arrows. Finally Indrajit uses the Nagapasha arrow to tie down Rama and Lakshman. Nagas or poisonous snakes form coils on the body Rama and Lakshman and they are made immobile. The poison takes effect on the brothers and both fall unconscious. The vanarasena is worried. Sushena, the physician, asks Hanuman to bring Sanjivakarani and Vishalyakarani two herbs. But suddenly a strong breeze appeared in the area. Mountains and trees started swaying in the strong breeze. Huge waves appeared in the ocean. Vanaras looked up and saw Garuda in the sky. He was fast approaching the brothers. The nagas that had tied down Rama and Lakshman were trembling in fear. When Garuda came near Rama and Lakshman, the snakes fled from the bodies of the brothers. Garuda stroked Rama and Lakshman with his hands and their wounds vanished. The brothers woke up as if from sleep healthy and with more vigor. The brothers hugged Garuda and thanked him. Garuda then told Rama that he and Lakshman were bound by Nagapasha arrows and only he could save them. Snakes are present in the arrow and since Garuda is their old enemy, the snakes fled on seeing him. Garuda then flew into the sky and disappeared.